Show and Tell photos from the last two meetings are posted on the PMQG Flickr page! We can't wait to see more of your beautiful quilts at the May meeting on Thursday! PMQG February Show and Tell, a set by Blue Bird Sews on Flickr. 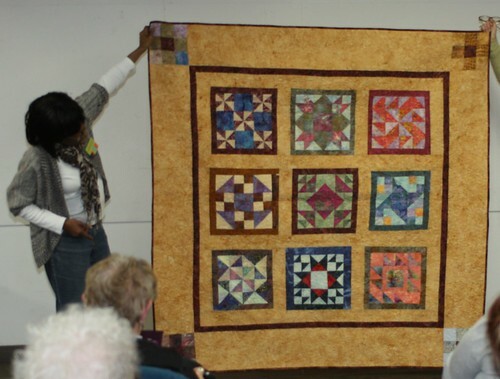 Check out all the beautiful quilts that were shared at our February meeting! We had some great quilts at show and tell at this month! This was a charity quilt made out of January's BOM Scrappy Trip Along. And two more charity quilts! Lauren Bowden created this quilt with her Tripping Down the Rabbit Hole pattern. She blogs at Lovely Frankenstein Designs. Lauren also made this quilt called Magic Carpet. Unfortunately I can't find any info on this quilt on the sign up sheet, if it is yours please let me know so I can add that info! We'll just jump right in, shall we!? The Bee Charmers - Scrappy Trip Around Charity Quilt! We had the pleasure of meeting Luke Haynes and seeing some of his inspiring work! You're welcome back anytime Luke! I hope you all enjoyed seeing these quilts as much as we did! Until next month! We had a wonderful show and tell at our February meeting! Thank you to everyone who shared! 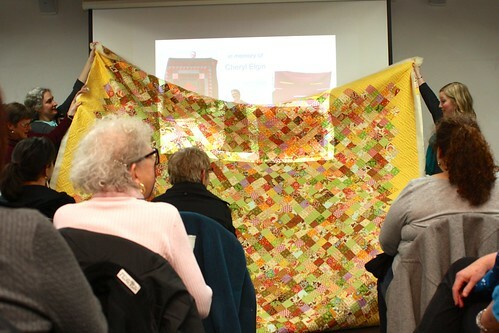 We had a moment to reflect on the the loss of our friend Cheryl Elgin, and were able to see her last quilt. Nancy Stovall quilted it and her husband Matthew brought it to the meeting, where Cheryl's good friend, Patty Turner, and her daughter, Hillary Elgin, shared it with the guild. Hillary hadn't seen the quilt before, but now it will be hers. Anne Matlak showed her quilt "The Sea"
Chris Pera showed her "Green Checks" quilt. She was trying to use less color than she usually does and used Jenn Carlton-Bailey's wavy quilting technique, which you can see on the back. Anne Woodman had a Doll Quilt and a Princess Quilt to show. These sat on her design wall for a while before she stitched them up! Joy Ruplinger shared this baby quilt. Jennifer Gleich shared her Madrona Road Quilt top and her tips for how she did the lettering. 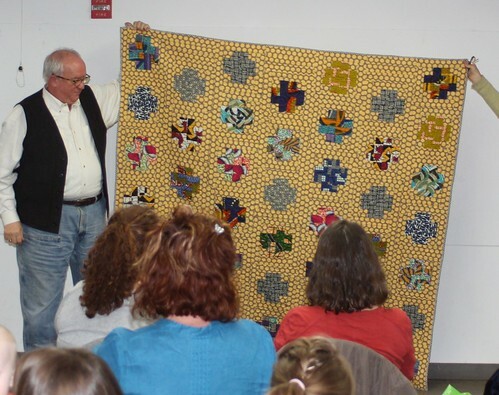 Bill Crane showed his African and Polka Dots Quilt which he used Susan Beal's Modern Cross pattern for. He says that he likes to have "weird backs" on his quilt. Veronica B. showed her Block of the Month quilt. 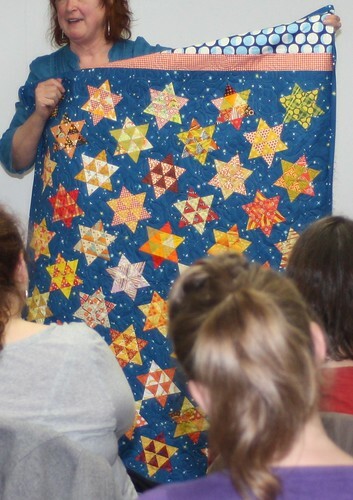 Anne Levant Prahl showed her Diamonds Quilt top. Anne and her mother worked on this quilt together from thousands of miles apart. 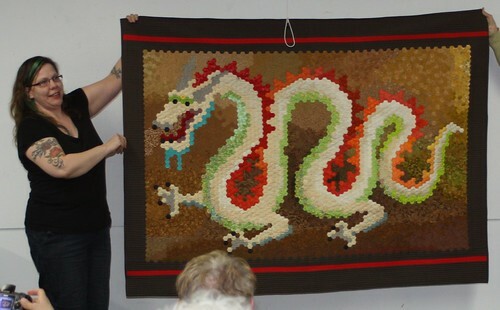 Anne says she makes really big quilts, this one was huge and she said she might still add a border! I can't wait to see what is shared next month! January's Show & Tell was an amazing kick off to the new year! So many beautiful quilts, WIP's and other handmade items were shared, inspiring all of us! Cathy Fowler shared her Modern Cross quilt and two strip quilts. One of which is her son's and it turns into a cape! Jen Carlton-Bailly's 5HTP Squared (top) and her 3-6-9 quilt made for the Madrona Road Challenge. Ann Symons brought some wonderful fabrics she found on a trip to Myamar to show us. There were so many great patterns and prints! Heather Lott brought in this great Polar Bear rug she made for her daughter. Sara Quigley had these great accessories to show us! Petra and her Madrona Road Challenge Quilt! Ale shared this quilt she made for her husband. She calls it Ben's Garden. Hope to see you all at our Sew Day this Saturday, February 2nd at Fabric Depot! Don't want to miss any Guild Blog posts? Try putting our feed in Google Reader or another RSS feed to get automatic updates! Our 2012 President Susan Beal giving away Ruby Star Wrapping. Nancy our little seen Treasurer hard at work renewing memberships for 2013. Some of the holiday gifts from our Holiday swap. We had so many this year it was inspiring! See all the projects with their recipients at the end of the post. We handed out our Madrona Road Fabric for the Modern Quilt Guild Winter Challenge. We will have a post up this week with all the details we announced at the meeting. At the meeting this month we also had a raffle. Two of our Cotton Couture quilts were raffled off raising over $500 for the Children's Relief Nursery and Bradly Angle House. I shared my quilt for Elizabeth Hartmen for our holiday swap. A twin quilt top I put together for Hurricane Sandy relief. 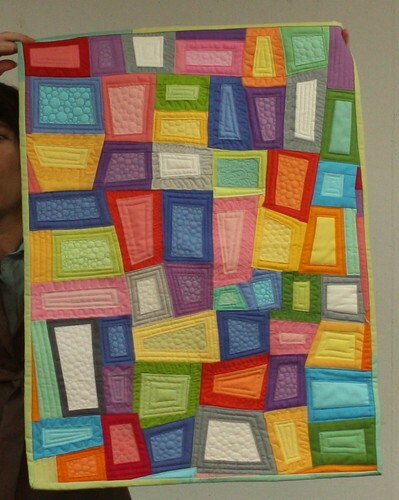 Linda Nussbaum shared her Patchwork Squares Baby Quilt. 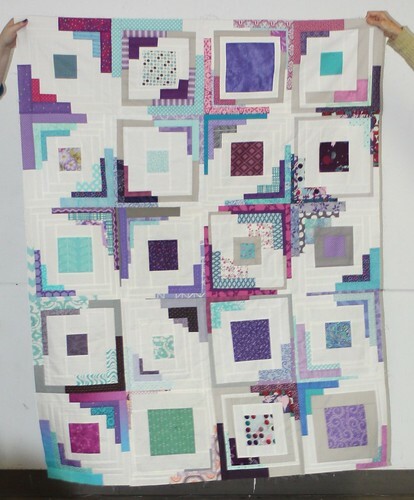 and lastly her Michael Miller challenge block made into a mini quilt. Soon to be new Board Secretary (my job) Amber Wilson brought a quilt she designed for her 5 year old nephew. "He has a little attitude thus the "Blah Blah Blah" fabric was a perfect fit". Back. Amber is AGypsiSoul on Flickr. Sara Quigley shared "It's a T-Shirt Quilt". All t-shirts from I think her daughter ACU student. Kim Lumapas, future Programs Board member, shared her Hexie Kist mini quilt. Kim is Perfection Not Included on Flickr. Nikki Paresi brought her Baby Boy Blue quilt, her first quilt! Rachel shared 3 quilts she quilted for the Guild. We made them at the Seattle Meetup and they will be donated to the Children's Relief Nursery. The Modern Cross quilts are from a pattern in Susan Beal's Modern Log Cabin book. The Stitch and Flip Quilt is a pattern from Katie's Quilting Modern book. Cherri Langley shared Got the Blues? made using a 4 patch block plus a half square triangle block to make a new block. She also shared this quilt. Bill Crane brought his Red and Yellow Barn Raising Quilt. Kelly Cole shared her Vintage Rework quilts. Made from a huge 16 patch top she cutup and reworked. Anne Woodman shared her Ghastly Quilt. She also shared Frankie's Quilt her first machine quilting applique. Lara Giles shared Penelope's Quilt a baby quilt for a co-worker. Cathy Fowler shared her Shaker quilt. Also her Modern Log Cabin Crosses top from Susan's book. Chris Pera brought her Mekong Quilt. A white whole cloth quilt made by women in Cambodia and Vietnam all had quilted. Michelle Freedman, our 2013 President, shared Same but Different. For her cousin's new twins. Susan Paris brought her Christmas Tree mini quilt. This was made from member Monica's fabric Susan won at a summer meeting. Elsa Hart shared Quinn's Quilt. Made with Bonnie and Camille fabric. 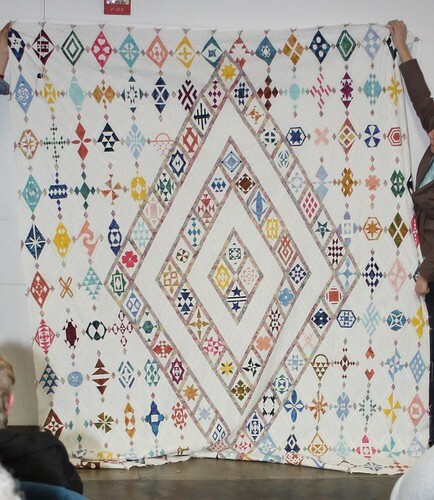 Jennifer Gleich brought her first modern quilt top an Anita Hartmann Design. Chelle Casey-Stevenson brought her Summersville Quilt. Heather Davidson shared her Vintage Whole Cloth quilt. Also her finished Eames inspired quilt. 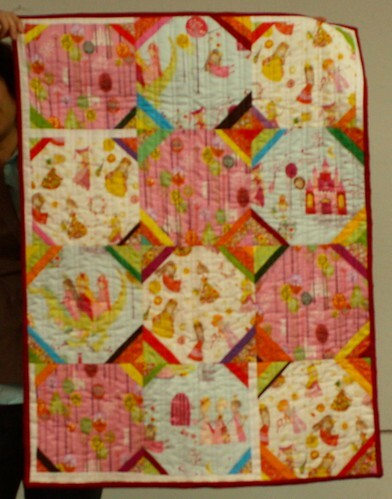 Jolene Knight shared her Sun Bonnet Sue quilt quilted for her family. All of our happy members with their Holiday Swaps! This is my last meeting recap! I had such a wonderful time being on the Board this year and am looking forward to many more years of learning, sewing, laughing, and swapping with our wonderful Guild. Everyone shared their beautiful & innovative use of stripes and chevrons for our Michael Miller challenge. Such an impressive showcase of amazingness! Thanks of giving us this unique challenge, Michael Miller! A few of these projects are on their way to Quilt Market, too! Also, we've seen these before, but it's fun to see them all together! We will have a poll on this blog soon, asking everyone to vote for which quilt should be entered in the QuiltCon collaborative quilt category. If you don't know what I'm talking about, click here for all the details! You don't want to miss the opportunity to submit your own quilt! We were so pleased to be able to share Angela Walters with MQX this weekend. 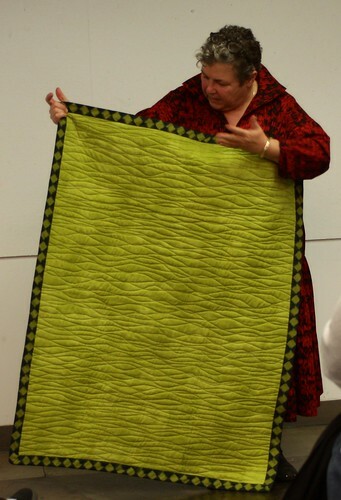 She shared with us many of her stunning quilts and gave us pointers for our own quilts. Petra's quilt that she made for her son, Avery. Cherri Langley "I hope you love birds too" Design from Ashley at Film in the Frig - I finally collected all four color ways of the paint by number birds, an "older" fabric line. The last colorway I found in Austrailia! Gail Weiss - Dragon Hexie Quilt top - 3,942 1/2" hexie top - took one full year to piece together - so excited to share with everyone! Christina - Nighttime Group Quilt - Eight quilters contributed a square and scraps for the border, it always works out perfectly! Brittany Scott - "Pixelated Love" Quilt made from a photo, 7,500 one inch squares (pixels)! Kory Keller - Hexi Pouch - first hexi project! Ale Kloch - "Little Leaves" A wedding gift for a friend. AnnMarie Cowley - "Diade los Muertos"
Thanks everyone for a great meeting! See you next month! There was a lot to share at this month's meeting so we have a whole separate post for you with details about upcoming events and what this fabric is all about for our paid members. Cathy Fowler brought in a lot of fun dresses, pants, and bags she made at a Pho for Three sewing party she hosted for 2 little girls wanting to give back. I am sorry I don't have a photo of this one. Thank you to all the members that made items and Theresa will still be accepting donations through the new year. We had a wonderful demo on a quick easy machine binding method from Judy Livingston guild member and E.E. Schanks buyer. She's putting a video together for E.E. Schanks and we'll post it for you when it's ready. We are also taking submissions for next year's Board if you are interested send us an email. We will have a post soon with all of the postions and their duties. Anne Whiting's ? ?My Chaotic Quilt?? a quilt for her so she broke all the rules. Chris Carlson's Cupcakes for Olivia an Irish Chain top with cupcakes. Juline Bajada's Beach Baby a custom quilt for a friend. Juline is Juline B on flickr. Kate Sharaf's Lone Star mini. Barbara Sanders shared 3 Pencil Bags for Pho for Three. 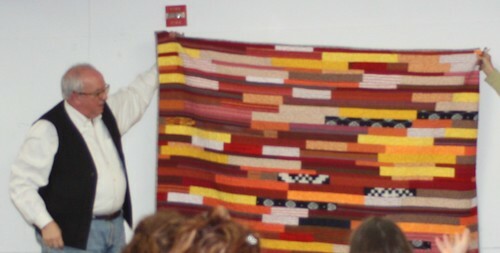 Jolene Knight shared two quilts made from corduroy scraps. Ale Kloch's vintage Granny square quilt top. This was hand pieced by her Grandmother and Ale is hoping to finish it. Joy Ruplinger's red and white. Susan Paris's Quilt, she's Susancp on Flickr. Susan was the winner of a Craftsy giveaway and she's won a free class from Craftsy! Crissy Roth's Swoon Pillow a hand quilted Swoon block turned pillow. Peggy Noto's Kate and Nate quilt. From a Modern Quilt Relish pattern Cheddar No Crackers. Amber Garrison had multiple quilts first 9 patch. Veronica B's Basket Weave and Diamonds top. Erin Olson's Blue Scrap quilt. Chelle Casey-Stevenson's Quilt for her son's new cousin. And Improve quilt top from Elizabeth Hartman pattern. Michelle Freedman's Go-Retro Quilt made with Pendleton Eco-Wool featured in Stitch Winter Wool issue. Also Fast Fun Flannel made with Maywood Studio Flowers in the Forest Flannels featured in McCalls Quick Quilt Oct/Nov issue. What a fun meeting we'll see you next month! We had quite a packed meeting this month! It started with our pouch swap with the Vancouver Modern Quilt Guild. There were so many beautiful pouches it was hard to see them all. Thank you Vancouver!! Are you going to Quiltcon? Our guild is a Gold Needle Supporter! This means when it's time to register for Quiltcon all of our paid members will receive a 10% off code to use. This will be specific to our guild and is not to be shared on blogs or any other media. Registration is August 30th and we will be receiving our discount code August 23rd. 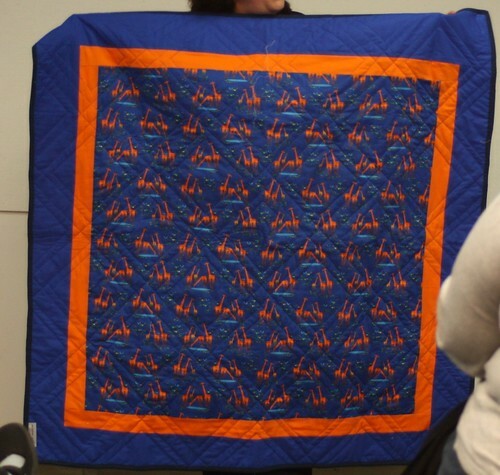 Heather and I shared a recap from the Pacific Northwest Modern Quilt Guild Meet-up. You can read our previous post here. Susan shared about the Denyse Schmidt class she and other members recently took, her post is here. We have two charities this month first member Teresa Cotes shared about Pho for Three. This post gives you all of the details that can be found on her Crinkle Dreams blog. Please head over and if you can sew a straight line you can help! Teresa is looking for little dresses, shorts, pencil pouches, little messenger bags, and a simple diaper wrap with the first batch of items heading out September 30th. This ends tonight at midnight so head on over to Alissa's blog so you don't miss out on her fundraiser. Portland members Susan Beal and Elizabeth Hartman have contributed prizes along with many other people. You will be entered to win if you make a donation to Action Kivu through the fundraiser. Action Kivu is run by Cate Alissa's twin sister and is a nonprofit that helps women who are victims of the conflict in Eastern Congo by teaching them to sew at a sewing workshop. Action Kivu also pays for children to go to school. If you are reading this post after August 20th you can find out more about Action Kivu and still help on their website. We had a visit from Lisa Anne a Portland guild member who has transplanted to Colorado to work for Craftsy. If you haven't checked out Craftsy yet it's a fun online community where you can take classes of all kinds of craftiness. Member Elizabeth Hartman will be starting her first series of classes soon you wont want to miss it! Lisa also shared about Craftsy's affiliate program and ideas about working with Guilds. Our Treasures Nancy did a wonderful talk on the history and evolution of Wholecloth quilting. I think this needs to be a future post on the blog so you can see all of the beautiful photos she had to share so stay tuned. Above are pieces by members Ale Kloch and Jen Carlton-Bailly. Lara Giles brought 2 quilts to share her Linen and Cotton Baby Quilt. Back where you can see some of the palm tree quilting details. Wacked Log Cabin by Cris Pera. Amanda shared her version of the Ron Swanson quilt. This is from a quilt along by member Monica Solorio-Snow. Also from Amanda her Twin Quilt. Gretchen Bertman shared her Architecture Boom. This is a memory album quilt made for her son when he graduated college. Detail showing each block with drawings or writing from Professors and friends. Linda Nussbaum brought 2 quilts. First for Baby Girl Hamlin a pastel block baby quilt. Second from a Jane Sassaman workshop her unfinished applique poppies. Linda's on flickr as Linda Beth. Kory Keller shared her Windows improv wedding inspired table runner. From Megan Dye blocks for Cocorico bee. These are paper-pieced quilt blocks for a flickr bee. Sara Quigley brought her Cowboy quilt top. Christin Ritz shared her small to Big Zig Zag Quilt. Back. You can find her on flickr as see.ritz. Ann Marie Cowley shared Swoon Leftovers from her Swoon quilt scraps. Back but you can't really see the beautiful quilting details go to her blog and check it out. Nancy Kennedy made this quilt from a pattern in Sweetwater Simple Home. 16 different red prints! Back with quilting by Nancy Stovall. Maria Cardenas shared her Floral Lap Quilt. Jolene Knight brought her Selvage Edge quilt. Back quilted with her new machine! Mims shared a vintage quilt. And 194 Lessons a half square triangle quilt for her daughters bed. Cherri shared Wonky Stars her Sparkle Punch quilt. Quilted by Nancy Stovall featuring a concatenation technique which blends many different patterns. 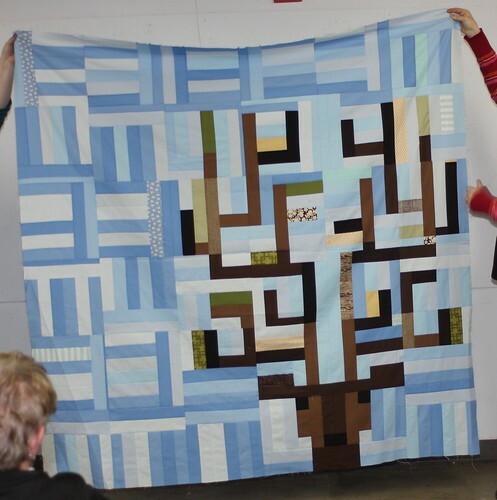 Renee Neustrum brought her Modern Crosses baby quilt made from a pattern in Susan's Book Modern Log Cabin Quilting. Teresa shared a miniquilt made with linen samples, old pants and new Alexander Henry fabric. Heather Lott shared a Senior Quilt. And Ocean Boardwalk her first all solids quilt. Back an enlarged version of the pattern. Heather Davidson shared her Flower Garden Baby Quilt top made for her best friend. Mary Ann Morrette brought her Red, White, Black, and Gray All Over Baby Quilt. She is on flickr as maremare312. Thanks for sticking around until the end it was a great meeting and we'll see you next month on September 20th. We had a lovely picnic in the park and while there was threat of rain at the end of the evening we made it out unscathed. This is an early shot of the group and our area filled up pretty quickly by the end of the day. The meeting started with a lovely thank you from Grayson Dempsy who is associated with Bradley-Angle House our January Charity focus and presented her with a group of quilts. If you haven't read about them check out their website. Next we enjoyed a presentation from member Monica Solorio-Snow of her new fabric line Winterkist! This quilt was shown at Sisters and was at Quilt Market. You can see on the backing that Monica designed this for fussy cutting so there is a lot of space around all of the gnomes. She also shared some cute bags but I am sorry the pictures didn't turn out. You can find more of her fun creations on her blog! This is my quilt top made with all different Voile's and Cotton Couture. It will be a gift for my Aunt and Uncle for their 50 and 60th birthdays. Bill Crane shared his Feed Sack Log Cabin Quilt. The back with it's Matisse inspired naked lady fabric. 6 year old Amaya shared her first quilt Pretty in Pink. She chose all her fabrics at Cool Cottons. Her Aunt is member Paula Wessells. Juline Bajada shared her L-O-V-E quilt. The Tula Pink "Love" pattern started out as the front of the quilt then Juline "got carried away" with the back and it became the front (below). Juline is JulineB on Flickr. Next from Jolene Knight we have her Brothers Wedding Quilt. From a pattern from Susan's Modern Log Cabin book. From Kelly Cole Shrinking Squares the tutorial is on her blog. She also shared this vintage quilt purchased at a garage sale. She hasn't found a pattern name yet if it's familiar to you let us know. 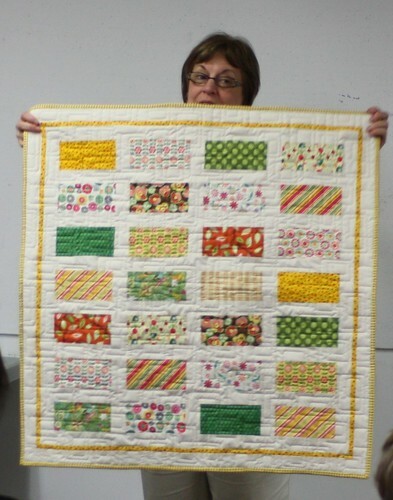 Anne Whiting shared her jelly roll Daisy Chain quilt using Noveau by Moda. Also by Anne this Scrappy Rainbow Fire Drill. This is member Elizabeth Hartman's pattern done in scrapes and rainbow colors. Quilted at Modern Domestic. Jill Collins shared her unnamed quilt top which is a variation on the "Portland Peel" template and pattern. Amorette shared her Curious Nature Hexies quilt top. It is machine-pieced hexagons made from Kona solids and Parson Grey's Curious Nature. Kristan Collins shared her Improv Quilt. 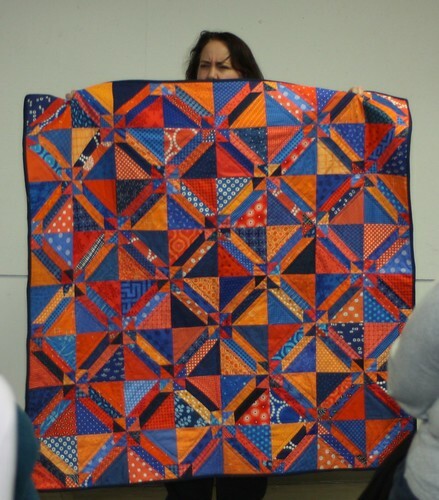 From Gail Weiss her finished Orange Stripe improv quilt. If only this photo was in focus! Here is Michelle Freedman's Swimming with Thread mini quilt for the Alzheimer Quilt Initiative. 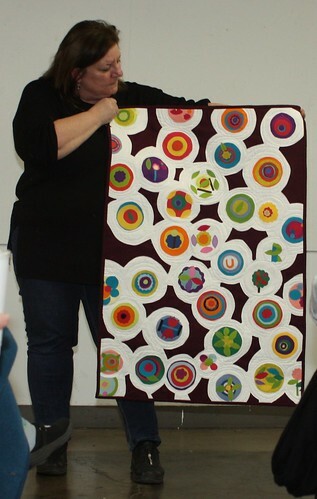 Susan Paris brought her "urban renewal" improvisational quilt an urban version of "your own village" class. 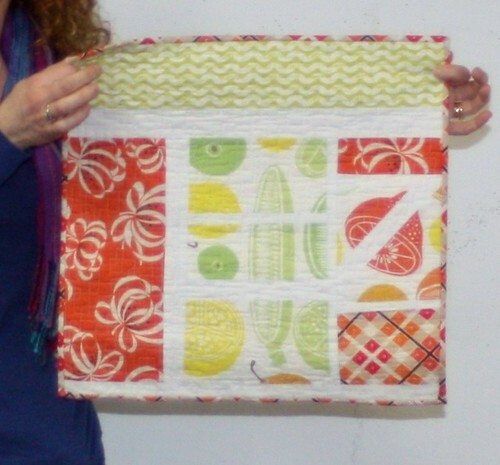 Bill Volckening shared his Julie Silber mini quilt made for Julie Silber. Also his recent purchase Tango Gardening but Jean Wells Keenan of Sisters. Kory Keller shared lots of firsts. Her quilt Chevron Girl which is her first quilt using something other then squares. Kory's first try at free motion quilting, Basic Boy Quilt. Also her Lot's of Dot's which is the first quilt made just for herself. Vickie Rooks shared 2 quilts of her mothers that she is finishing. First Jeweled Stars. Back in which she is making a special effort to label every quilt. Also a quilt made from assorted blocks. Jen Carlton Bailly shared her first whole cloth quilt made for the Melody Miller Quilt Market booth. Also bébé Sapling baby quilt. Suzanne Gray brought her classy denim picnic blanket. Thank you to everyone that joined us we'll see you all next month at PNCA, Thursday August 16th! Last week's meeting was such a fun meeting! Amanda started things off with sharing all about the amazing quilting community that exists on Threadbias. If you haven't checked out yet, go there now! Elizabeth shared all about her new book, Modern Patchwork. She walked us through some of her quilts and quilting techniques. Thank you so much for sharing with us! To see descriptions and links to blogs, look below each photo collage. Erin Gallagher - Baby Log Cabin quilt made from one large log cabin block. Bill Volckening - Marvelette - for "Manland" exhibit in Sisters. It was one of his first quilts. Mary Bywater Cross - Quilts made from 100% wool, traditional quilting patterns, quilted with Perle Cotton. Wendy Mamahali shared her Massai quilt. It celebrates the beautiful story of the Massai people of East Africa. Lara Giles - Baby Quilt made from left-over scraps after cutting curved blocks from another quilt = inspiration! Violet Craft - Broken Herringbone in Madrona Road citrus colorway. Dawn White - Mo Bedell's Party Dress from class at the Pine Needle - Ruler from Sew Kind of Wonderful. Black & White quilt, pattern from quilt magazine. Anne Whiting - Chevron Quilt made from pattern/tutorial at the online Moda Bake Shop. Picnic quilt - disappearing nine patch, quilted on home machine. Anne Woodman - Quilt Con Reject Pillows - The pillows are made from blocks I decided not to submit for Quilt Con block contest. Megan Dye - Trajectory 2 - Second version of Trajectory based on mid-modern boomerang design motif. Amber Garrison - Sample 9 Patch - Nine simple log cabin blocks - light colors - for baby! Michelle Freedman - Park blocks - Improv bee - completely finished! Thank you all so much for coming! Remember next month, we plan on meeting at Laurelhurst Park for a picnic! Feel free to bring family and food! I have been so busy with the Sew Mama Sew Giveaway Day this morning and I almost forgot this post! This month we had a wonderful presentation from Amber and Paula on utilizing your camera for photographing quilts. One of the big tips is read your manual!! Crazy right but really so important. We also learned a lot about lighting. We are lucky to have the overcast days in the Pacific Northwest which is ideal. I am hoping to have some more info from the power point for you soon. We also had a 10 minute presentation by Michelle on participating in swaps and a new fabric swap she's hosting for guild members. Here's the link to the swap I think there are ten spots left. Michelle is also giving away a spot on her blog for Giveaway Day the winner will receive a pack of all of the final fabrics. Nancy K. shared her crib quilt Pinwheels for Jackie. Michelle had her Improv quilt Park Blocks. This was a result from a group "bee" effort "Think Outside the Block" and her own composition. Nora Simon shared Equestrian T-shirts quilt. Made for her sister's 21st birthday out of t-shirts from horse competitions. Jen shared a gift she received from Megan this Buttercup paper pieced mug rug. 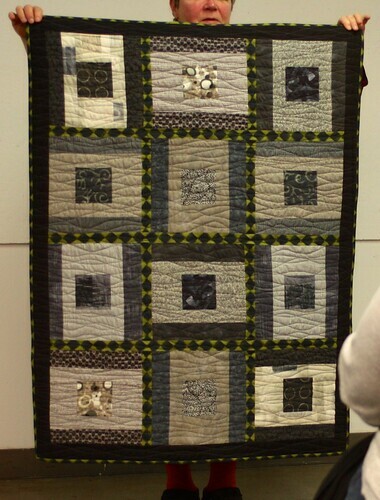 Susan shared her quilted and bound Oceanside quilt. It was inspired by a trip to the beach and seeing a public sign on weathered wood. Nancy Stovall quilted it with whales and waves. It's all Michael Miller Cotton Couture Solids. Amanda shared her braid quilt. Back and this was her first time free motion quilting. Kimberly shared Gypsy Girl which she made for her 18month old daughter. You can find her on Flickr as Perfection Not Included. Gretchen shared her jacket made from vintage quilts. Cris brought her Black and White quilt using the one block technique. This was also shared by Cris and quilted by Nancy Stovall. Ann Marie brought Not Intended for Children's Sleepwear ll a selvage quilt. Jill shared Purple Iris made for a baby named Iris. 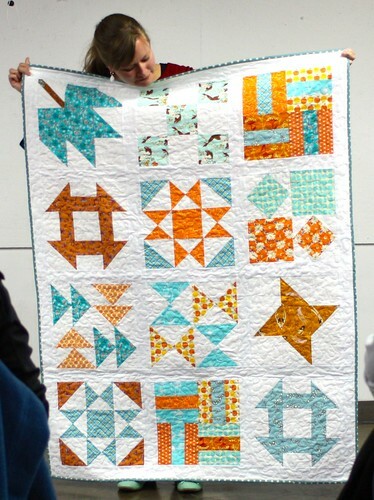 An orange peel style quilt made with her own templates designed with Rachel available on her blog. Doll quilt made with more Peacock Lane. a Happy Zombie quilt made with Annela Hoey's fabric. Heather brought her Retro Modern quilt. Paula shared her Star Struck quilt top. Heather brought her Precious quilt. She used her "precious" stash of Neptune! Amber shared her Baby Log Cabin. 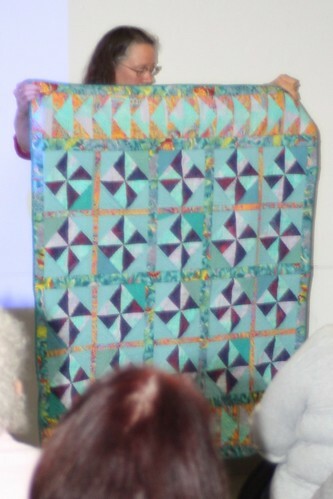 She also shared her Green Triangles quilt. 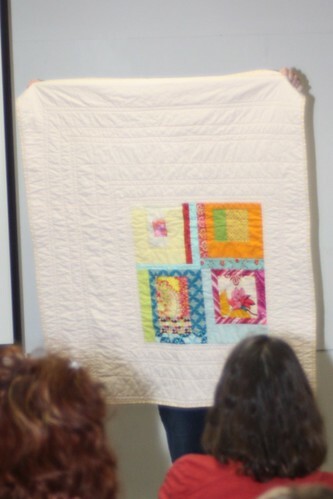 and shared her Confetti quilt which used a layer cake cut in strips not individual blocks. Pattern by The Pattern Basket. Erin shared a quilt she made for her Mom. We'll have the quilt survey up in a day or two so stop back by to participate. Our wonderful President Susan starting out the meeting. From now on I am going to leave out the part where I tell you this was a big meeting with lots to share and lots of photos. We pack a lot into our meetings every month because we are so excited to be together from now on these posts are big! Susan shared these classes and announcements with the group. Improv blocks from our All Day Sew being made into a quilt for Quilts of Valor. Jen did a 10 min tute on making zipper pouches her way. Jen did a great 10 minute tute on a making a zipper wristlet pouch and I shared a tutorial on snaps. This is all to help prep for a pouch swap we'll be doing with the Vancouver BC Guild. There was announcement by the panel that will be choosing the quilts to be in our PMQG special exhibit at the Sisters Outdoor Quilt Show. You can find info on that under the Sisters tab above. For our mixer this month we displayed our blocks for the Michael Miller Cotton Couture Challenge. Forty Four blocks in all I am not sure how Kathy Miller is going to choose just 16! The remaining blocks will be made into quilts for charity and one to be displayed at Sisters. We were struck by the diversity and beauty of each block they all turned out amazing. Violet Craft shared a peak of her new fabric line Madrona Road! I can't wait to sew with it. Heather our vice president did a great talk on dynamic blogging. She has created a wonderful resource page above for everyone to use Update: 1/13 Follow the Dynamic Blogging link highlighted above (for the information that used to live on the page) to find links to blog design resources and a great how to for making those cute little buttons you see on the sides of blogs. Matthew shared his quilt top Glimpse of Future Dimensions. Susan shared her entry for the Sisters exhibit. The design is based on a sign she saw three years ago at Oceanside Oregon. Lara shared some things she's made from the Zakka Style book. Rachel shared her English Strippy Quilt. Cris brought her Amish Stained Glass quilt. It was inspired by a quilt in the book Amish Abstractions. Kate's Half Square Triangle Peeps quilt. Anne W. shared Rainbow Baby Quilt. This was inspired by the "Gumdrops" quilt in volume 2 of Sew Scrappy. Also from Anne Forever Black & White. This is Elizabeth Hartman's Birdbath pattern from her book Guide to Modern Patchwork. Quilted on Modern Domestic's quilt frame. Cheryl E. brought Not on the Quilt,dude! "Which came first-the quilt or the Lebowski adoration robe? You be the judge! Sewing is good for the soul, "Careful Man!" Dee shared her Bug Jar quilt made for her 4 year old Granddaughter whose parents call her "Bug". Jill shared Moons of Many Colors. Jane shared a quilt top from her "Civil War" block swap. and her Baby Quilt made with Peacock Lane fabric. Amanda shared her quilt top from a Modern Minimal Pattern. Amorette shared her Sparkle Punch Taza quilt. This is also a pattern from Elizabeth Hartman and a quilt along. Bonnie made this for her Mother for Mother's Day. This is a Thomas Kinkade panel she did using a creative stitching technique learned from a Craftsy course. Back with her first label. Judy shared her Harmony and Friendship quilt. It was made with Japanese taupe's in response to the Tsunami last year and was inspired by a fund-raiser concert. 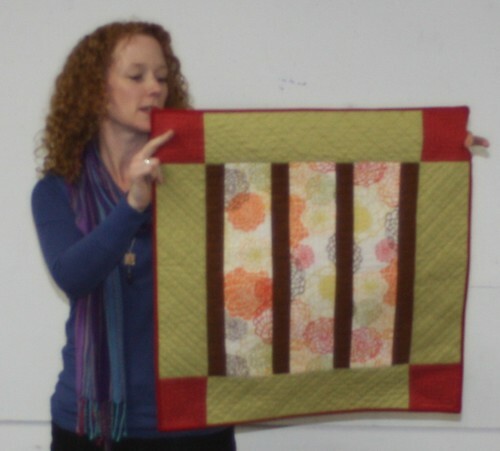 Gail shared Orange Stripe and Improv quilt inspired by our last meeting. This was made with fabric from old sheets, clothes and stash. Thank you for visiting the Portland Modern Quilt Guild! We had another full house this month! Our meeting started out with a wonderful presentation by Michelle Freedman on Improv quilting or as she calls it "Think Outside the block". Here is a little taste of her presentation. Her presentation concluded with a mini tutorial on making an improv block and confetti block. Here are some links to tutorials and articles courtesy of Michelle. Design Camp Flickr Swap, Michelle's swap. Some improv blocks by Heather and I. We also revealed the fabric colors for our Cotton Couture Challenge and passed out fabric to our paid members. The fabric colors from left to right are Fog, Meadow, Clementine, Luna, Charcoal, Kryptonite, Tangerine, and Aqua. If you were unable to attend the meeting and would like to participate in the challenge you can pick your fabric up from Nancy at her studio just call 503-234-0403. 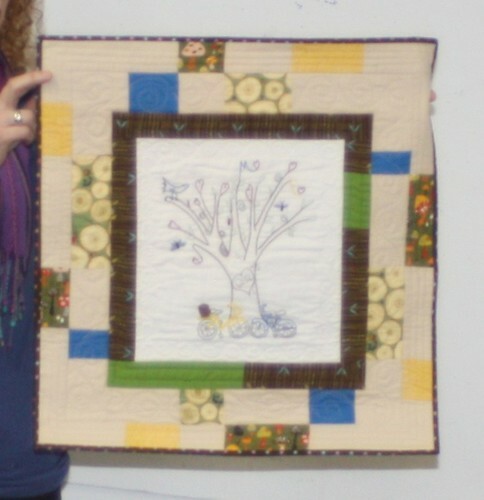 Nancy shared her quilt from her Sweetwater Simple Home book review. We gave away the book and pillow made by Nancy. Also in the giveaway this month were 4 $10 gc to Cool Cottons! Quilt my me (Pétra) made for our school auction this year and it was quilted by Nancy. Quilt by Katie. She found a hand sewn quilt at a yard sale for $20 took it apart and made this. 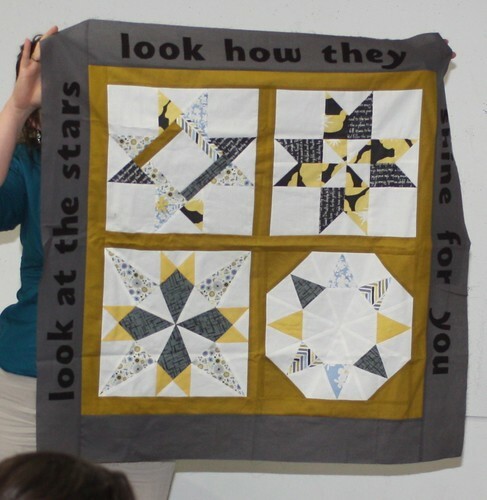 The stars are from the original quilt. The back is a vintage sheet. Katie also shared a nice bag but the photo didn't turn out, sorry Katie send me one if you have it. Cathy made this zig zag quilt for herself. She used wool batting. I don't have a show and tell sheet for this one please send your info and or a better photo and I'll update. Quilt by Jill. This quilt was inspired by spring flowers blooming in her neighborhood. Second quilt by Rachel testing out a templet by Jill. Quilt top by Michelle using Pendleton Wool fat quarters. and 930 hexagon quilt top!! Wavy Gingham quilt by Cheryl. Cheryl made this by hand dying ginghams from Colette Fenske. She bought the fabric in 2004 and waited for the right inspiration she found it in a Civil War quilt book, "the old is new again". Megan shared her Trajectory quilt which was inspired by mid-century modern boomerang design motif. Anne's W. Vintage Nation quilt. Quilt made for her best friend using all vintage and 30's reproduction fabrics. Free-motion quilted on the new quilt frame at Modern Domestic! Jolene shared 3 fairy quilts. and one for her daughter. Kate shared half square triangle placemats. Lara had 2 baby quilts for co-workers. Christina has been working on english paper piecing making some Sprockets. Violet shared her Light Cycles quilt inspired by Tron and using her Peacock Lane fabric. Anne W. shared her Tayamasie quilt also made with Peacock Lane. AnnMarie's quilt from the Made in Cherry Quilt Along. Gail shared this king size quilt made for her in-laws Anniversary. Kelly made a Queen sized man quilt made for a friend; Valve quilt offset with "Summer Sampler Series 2011" blocks set in randomly. Anne M. shared Cherrywood Improv made with old scraps used for playing. If you're still here I have a few more name tags to share. Thank you for another fun meeting! Stay tuned this month for Member interview's and another book review. What a big show and tell this month!! I am going to get straight to the photos I know that’s what you want! All of these will be on flickr for you to see larger versions. By Jeri Who Gives A Hoot. This is from one of her first online quilt along's and her first attempt at Bishops Fan Quilting. By Cherri quilt top #7. Cherri challenged herself to use a patterned fabric for her sashing. Mixed print blocks. Elizabeth Hartman Sparkle Punch quilt. You can join in the quilt along here. Back, it's like two quilts in one. Suzanne Gray's Tie Quilt. This was made from both her Grandfathers ties. They passed away in 2010 and she made quilts for family members. Kate Sharaf Bento Box baby quilt. Linda Nussbaum's Stacked triangle wall hanging made For the Love of Solids swap. Also by Linda do Good Stitches Bliss quilt top. You can find Linda on Flickr under Linda Beth. Monica of Happy Zombie brought two quilts to share. By Jenn Friesen Perfect Nap Quilt. This was made for her daughters school auction. Also by Jenn Scrap Quilt. This was inspired by a game at our All Day Sew. "I used only scraps out of my bin. So fun and liberating to make. Plus yay to using up scraps". Sorry for the bad photo you can see a better one on her blog. Marcia Mersky made this lap quilt for her Mom's 88th Birthday! By Megan Dye I heart Sushi designed by Artisania. Megan did a paper piecing pattern test for this quilt. You can't resist the sushi fabric. Jill Collins made this Robot Seed baby quilt. Suzanne Reynolds "Pristine" by Villa Rosa Designs. Lisa Anne Logan shared her first quilt! 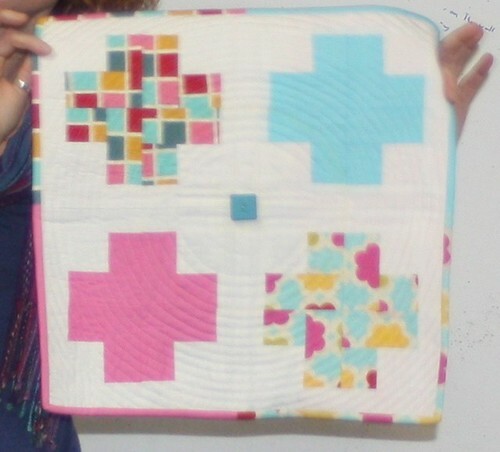 This charm squares baby quilt was made in Elizabeth Hartman's class at Modern Domestic. Fabric includes pink shot cotton, gold metallic, natural and dark linen among others. Based on Precipice #3 by Crystal Jackson on Etsy. Ale shared a pillow she made for Rashida Coleman-Hale using Rachida's new Washi fabric line. Ale's new bag made from an Anna Maria Horner pattern. runner using more Washi fabric. Lara Giles started this Log Cabin #1 quilt in 2005 for her Dad she decided to hand-quilt it and finished it in 2007. This is Lara's Log Cabin #2 which she was inspired to make after Susan's Log Cabin presentation last year. This time she tackled machine quilting. By Kim Lumapas Sam in Outer Space a quilt for her 3 year old son. She's Perfection Not Included on Flickr. Becky McCabe made this quilt with fabric won at a PMQG meeting. It's a thank you quilt for her "goth and giggly" friend Sira who loaned her squirrel cages and gave her squirrel raising advice. Violet has been making blocks out of some of her friend's unwanted scrap fabrics. They were flipping through pretty quickly but I got a few good photos. Here is Bonnie Lindblad's sewing machine organizer with name tag attached. The photo I took didn't turn out thank you for sending one. This was made using a pattern from Sew Happy. I'm still inspired every month by all our member's work I hope you are too! Our first meeting of the year! We had quite a turn out with a lot of new faces. Thank you all for joining us I hope you had fun. Our new president Susan led the meeting thanking our previous board and introducing the new one, we'll tell you a little more about us later. One more time thank you Christina President, Michelle Vice President, Rachel Treasure, Katie Secretary, and Megan Programs. It was a fun year and we appreciate all the time and energy you put into the Guild! Susan also acknowledged all of the guild members that contributed to Quilts for Quakes. Quilts for Quakes sent 30 quilts to Japan, raised $2825 directly for Mercy Corps, plus $660 via the Craft Party at the Museum of Contemporary Craft in June. Thank you for all the fabric donations, sewing, and quilting! The final few quilts will be going to Bradley-Angle House, in two waves as the last volunteers finish them. We will be posting a little more about Bradley-Angle House soon. Our ten minute tute this month was all about making your own name tag. After seeing all of the beautiful ones at the Sewing Summit this year we thought it would be fun for our guild to make their own. This is my name tag I made for the Summit. Mine was made by sewing scraps together for the boarder and stamping my name and website in the center with archival ink. My tip is stamp before you sew so if you have any smudges (like I do) you don't have to start over. Instead of adding binding, I chose to layer my front and back with batting, right sides together, sew, and then turn right side out. If you'd like to do binding on your name tag this is a great tutorial by Kerry of verykerryberry for making single binding for small projects. Here's a few name tags from the Sewing Summit. You can see the variety in style and size aren't they fun! At next months meeting we will have a mixer to share everyone's name tags. If you missed this months meeting we do have pin backs for you to use but in the meantime you can use a good ole safety pin or make a lanyard like Angela did above. Now onto Show and Tell we had a lot of beautiful quilts this month! But really, I think we always do, so I might be biased. Paula Wessells Garden Auction quilt, garden designed by Kindergarten students and Paula's first time doing applique. Also by Paula her Do Good Stitches Word Quilt top. Kelly Cole brought her Retro Bento quilt. Kelly used vintage fabrics for this. Jolene Knight had a few to share. First made with Christy Cuzza this lattice quilt with scalloped edge. and Modern Log Cabin Baby boy quilt. Sorry Jolene I'm missing one of your photos. Rachel Kerley shared her example from a quilting demo she and Cherri did at Modern Domestic for the shop's new quilting frame. Rachel also shared this Triangle Quilt she made using fellow member Jill's TabSlot templates. She also showed this top she made using the scraps. One or both of these will be going to the Children's Relief Nursery. Kate Sharaf's Drunkards Path quilt top. Kate has been doing a quilt along for this on her blog. Anne Matlak's River Quilt a beautiful log cabin. Amorette's Art Gallery Improv Quilt which is a charity quilt and she had a lot of fun with the improv blocks. Christina Cameli's Double Disappearing Nine Patch quilt top. Also, her first Spoonflower fabric design of Selvages on Steroids! Cherri Langley also brought in some Spoonflower fabric First Color Chart which is a copy of the first commercially designed color chart from 1680 fabric by Peagreengirl. this Love Summertime Stars quilt top pattern by Fig Tree Quilts. Aly Good's La Tortuga Quilt. Look closely, you'll be able to see that the turtle shell is three dimensional and there's lovely quilting detail. Jen Carlton-Bailly shared her Quilted Weekender Bag. Congratulations to Jen the new Social Media Coordinator for the Modern Quilt Guild! Alexandra Kloch shared her quick and easy snugly blanket that's backed with Minky. Also, Ale brought this mini snowflake quilt. One more item to announce and then I'm done I promise. Our next All Day Sew will be on February 4th at Fabric Depot so mark your calendars! We'll have more details for you soon. The evening was full of chatting, delicious snacks, beverages and gifting. See all you all in the new year! January 19 at 7pm. • December's Meeting is Thursday the 15th featuring our 2nd annual holiday gift swap and pot-luck! • One of our members has started a quilt shop in Vancouver, WA—check her out! Bill Volkining "Master Piece Quilts"